The road from the Bex (432m) via Gryon (1114m) and Villars-s-Ollon (1253m) is quite nice with mostly open views of mountains all around. 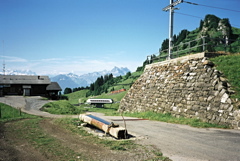 It is also quite steep in places, but the road is almost flat between Gryon and Villars. On this latter stretch a railway with trains is occupying half of the road and you better watch out here! The road from Ollon (476m) via Villars is also steep, but wide and good. As you climb out of Villars in the direction of Col de la Croix (1776m) you will see a narrow, tiny road go off up the mountainside to the left. This road is very steep with gradients up to around 20% here and there. A train actually also climbs this mountain to the pass and you will meet the railway at Col de Soud (1521m) (after a descent from 1548m) and you will come close to it at another train station, which is also a pass – Col des Bouquetins/de Beaucul (1760m) (the road up there has some asphalt, but may be a bit rough for 115m). Between these railway stations you will find a stretch of gravel (350m), which I could not remember from my first visit here and it is easy with a road bike. Before this gravel 35m from the road there is another Forclaz (pass) at 1601m. It also looks possible to climb via the golf club road starting higher up toward Col de la Croix, with maybe only 45m gravel, but I have not got this confirmed. The train stops at the pass and soon thereafter the asphalt alrso ends, but one could continue down the other side (on a slightly bad gravel road, where it is steep) to meet asphalt again 1.4 km later as you go around the Lac des Chavonnes (1697m) (one could take a more direct gravel road here also instead of going around the lake, but I doubt it is a better choice even if I had it recommended). Then you climb 100m up to Vy Boveyre (1795m) (a pass) on a good asphalt road. From Vy Boveyre it is a fast descent and you can take off on the first asphalt road going to Vers l’Eglise (1126m) and then continue toward Col du Pillon (1546m) or go back via Col de la Croix (1776m). You can continue down to La Forclaz (1261m) (which should be a pass too, even if not so clearly marked) and here you can either go right down to Les Aviolats (1079m) to climb Col des Mosses (1445m) via Les Voëttes (1341m) on a nice narrow road or continue down on the main road to Les Planches (943m) and up through Le Sépey (980m), where you could go down to Aigle (417m), or go to Col de la Pierre du Moëllé (1661m) (which may still have short gravel on the other side) or possibly visit Col de Prafandaz (1575m) on a dead-end road (which I have still not visited). Other comments There is a restaurant at Col de Soud and there are restaurants at Bretaye and also a hotel. In La Forclaz, I also noticed a small hotel. There are splendid views from the pass and I am sure they would be even better if you followed some of the paths from the pass to higher points.